Some phrases we hear every day in the English-speaking world come from the times of William Shakespeare, the most famous playwright in the English language. Neil and Finn bring some of these to you in 6 Minute Vocabulary. Learn them and use them to spice up your English! Hello and welcome to 6 Minute Vocabulary with me Neil. And me, Finn. In this programme we're talking about phrases from Shakespeare. They're phrases that were either invented by Shakespeare or used by him in his plays and that we still use a lot today. We'll give you plenty of examples of these and we'll teach you what they mean. We'll have a quiz; and we'll also bring you a top tip for learning vocabulary. Let's start with Danny. He's talking about cooking, and entertaining friends. And while you listen, think about this question: Does Danny think it's easy to find special ingredients for recipes? For some people food is the be-all and end-all and I have friends who, whenever I visit, produce a dish fit for the gods! But in my opinion, cooking is not for the faint-hearted. I really hate spending forever and a day in the kitchen. Dinner parties usually mean trying to track down some special ingredient, which ends up being a wild-goose chase. It's pretty much a foregone conclusion that my chosen recipe won't work out as I hope. So I just throw a party once a year to repay all my friends in one fell swoop. Fortunately, every one of them has a heart of gold, so they understand! That was Danny. And we asked you: Does Danny think it's easy to find special ingredients for recipes? And the answer is no, because usually it's a wild-goose chase. 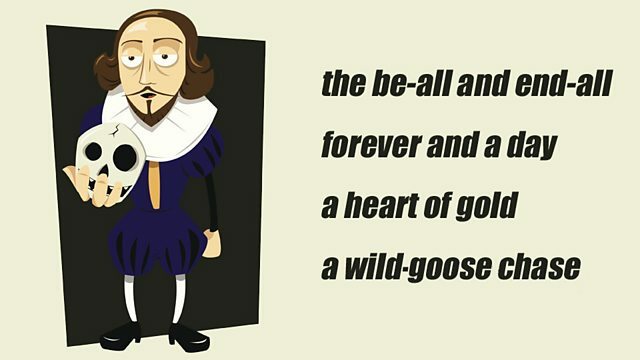 Now a wild-goose chase is used in Romeo and Juliet. This means a situation where you waste time chasing after something that you can't get. So Danny clearly has had bad experiences of trying to find ingredients and not succeeding. Exactly. Well, there are four more Shakespearean phrases in our first clip. Listen out for them! For some people food is the be-all and end-all and I have friends who, whenever I visit, produce a dish fit for the gods! But in my opinion, cooking is not for the faint-hearted. I really hate spending forever and a day in the kitchen. So food is the be-all and end-all. That's the beginning and ending of everything, which means it's the most important thing. And that's why they always produce a dish fit for the gods. Clearly if something is suitable for the gods, it is the best possible. But cooking is not for the faint-hearted, Danny says. The faint-hearted are people who lack courage or determination and he thinks people like that shouldn't cook. This phrase shows how difficult Danny finds cooking. And he hates spending a long time in the kitchen. He does. Forever and a day is a very long time! Right, there are three more phrases coming up in our next clip. It's pretty much a foregone conclusion that my chosen recipe won't work out as I hope. So I throw a party once a year to repay all my friends in one fell swoop. Fortunately, every one of them has a heart of gold, so they understand! Now, if something is a foregone conclusion, it's a result that is certain to happen. He thinks it's certain that his recipe won't work out. And that's why he entertains his friends in one fell swoop. Now if you deal with things in one fell swoop, that means you deal with them all together and suddenly, like a bird sweeping down through the air to attack something. Yes, he doesn't want to cook for people more often than necessary! But fortunately his friends understand how he feels, don't they? They do. They each have a heart of gold. Now that means they are very kind and caring. And it's quiz time! Today you have to change the last three or four words of each sentence to use a phrase from Shakespeare from the programme. So number one: Some successful people don't go to university. It's really not the most important thing. Which phrase from Shakespeare can replace the most important thing? It's really not the be-all and end-all. Right. Number two. We got stuck in bad traffic so the journey took a very long time. So what can replace a very long time? The journey took forever and a day. Correct! And number three: Everyone thinks Clare is the nicest person. She's always been very kind. What can replace very kind? She's always had a heart of gold. She has. That's excellent! And that is the end of our quiz. Well done if you got them all right. But before we go, here's today's top tip. English is very rich in phrases and idioms like the ones in this programme. Using them makes your English sound much more like that of a native speaker. Use an idioms dictionary and try learning five idioms a day. Then try working them into your conversations too. You can download 6 Minute Vocabulary from our Unit 29 Downloads page. Remember, you can also subscribe to the podcast version. For some people, social networking is the be-all and end-all of their lives. You don't need to make a dish fit for the gods. It's just a relaxed supper. Mountain-climbing is not for the faint-hearted. This homework's going to take me forever and a day. I'm sure our team will win the match. It's almost a foregone conclusion. Let's call a meeting and deal with all these points in one fell swoop. Alice always thinks of other people. She has a heart of gold. For more phrases from William Shakespeare that are still in use today, check out our series Shakespeare Speaks. Now you've listened to 6 Minute Vocabulary, why not take the time to read more about this topic and try some quizzes? Join us in Activities 2 and 3.